RapidCop / eRaksha is an all-in-one app for law enforcement professionals to document incidents with two way communication between the control room & officers in the field. Law enforcement departments will have several options for the crime information submitted in the reports, including adding a photo or video to a report, providing more valuable data for the Police. RapidCop is mainly designed to empower citizens in earnest “incident reporting” to help law enforcement officers in maintaining a crime free society. It comes with a packet of persuasive characteristics to help citizens find instant help whenever they require. Our team’s passion is to improve quality of life and to make the world safer for all of us. This is what we call as “TRUE IoT”. Real time tracking acts as a deterrent and prevents unwanted incidents. Timely response in emergency situations helps preventing crime and saving lives. Unified communication coupled with incident management and computer aided dispatch will help the police to respond to emergency situations on time. Citizen can contact the emergency number through various communication channels. 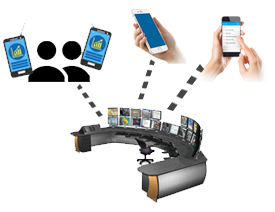 Unified communication integrates all communication channels and police can manage and respond to complaints quickly.s quickly. Digital beats help crime prevention and detection. Historical data reports can prioritize patrolling areas and the command center can monitor and alert the field personnel on the patrol vehicles. Public safety is never complete without the participation of the citizens. Our citizen app can alert them with accident spots and crime activity in the area they are living. The App also has interface to report incidents and share vital information that will help tracing the criminals. The command and control center application provides a dash board that will provide contextual reports, critical alerts, and action recommendations. The stakeholders can interact with the system through mobile and web applications. 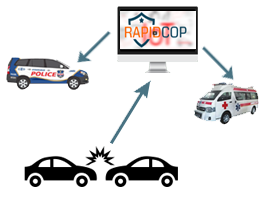 Coordination with various departments their jurisdictions is made easy with RapidCop. The police vehicles can be monitored in real time. The vehicles can be geofenced. Events like Bandobasth is made easy with our event management modules. RapidCop also can manage inter-departmental complaints from Police personnel. Our True IOT technology platform connects all stakeholders in real-time. The field officers, the patrol vehicles, the ambulances, the police station, the fire stations, the hospitals, the security camera surveillance systems, and the police control room are connected in real-time to share data and to communicate instantly. Citizens, when in need, can also be connected to the system. The real-time intelligence changes the way the police address the issue of the public safety. Officers can also use these communication channels to exchange information with other stake holders. Our proprietary Control Room application helps the police to optimize resources in emergency response situations and in day-to-day operations. 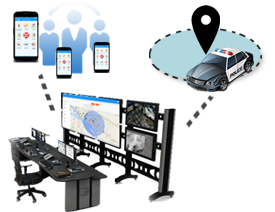 Real-time two-way communication between the dispatch center and officers in the field is possible with RapidCop. Control room can monitor and track the incidents, scene of crime in real-time and direct the field personnel as per the requirements. Reported incidents areas, crime scenes, and other emergency situations can be tracked monitored remotely through the fixed security cameras, body cameras, and the cameras positioned on the police vehicles. The real-time camera feeds will help the control room to assess the situation correctly and respond in real-time. The computer aided dispatch system locates the nearest police vehicles and can be sent to the reported location in the shortest possible time. RapidCop brings in efficiency, transparency, and accountability to department operations. The police vehicles can be monitored through Geo-Fencing, Live Tracking, Vehicle history, Over speed reports, tamper alerts etc. RapidCop also brings in transparency in the inter-departmental complaint management & communication, and improves the efficiency in administration. 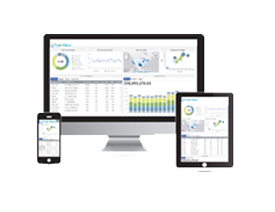 The real-time analytics has in-built Artificial Intelligence and Big Data functionalities and the reports are generated in real-time. The stakeholders can access the reports via web & mobile applications. The reports are generated based on the context and the intend of the user. Common man using the Citizen App will receive information based on his location and a police official is presented with the reports based on his designation. Every user will get the required information at that moment. 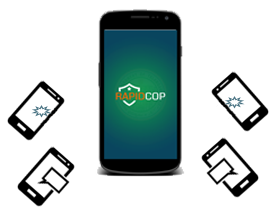 Rapidcop can provide timely alerts to improve the public safety. Citizen App can alert the drivers when they approach an accident spot. RapidCop has an in-built capacity to recommend what can be done in each situation.When an accident is reported, RapidCop can quickly locate the nearest police vehicle and ambulance and contacting them is made easy with a simple click of a button. The system will learn from the past actions and improve the quality of the suggestions.